A human understands what is going on when they see content in two languages on a single web page, but a search engines may have trouble figuring out which country search index it belongs in. 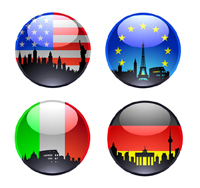 Multilingual SEO presents a set of problems that must be dealt with on a number of levels. Not only do you have the problem of properly translating your English-oriented website into another language, you also have to deal with a number of technical issues that impact your SEO footprint. These issues include the flexibility of your content management systems, your domain name strategy, the software platform that you’re using and real estate display issues, such as getting text to fit in the original allotted space (e.g., buttons and menus). Does your website have a critical mass in content and refresh this content regularly? Do you use a CMS platform to manage and deploy content to your website? If so, you should make sure that your software platform gives you full editorial control over all Meta data, and you should think about the following issues that plague certain CMS platforms. If your CMS platform generates URLs that contain numbers, parameters and session IDs, these can often be problematic for search engine crawlers, and you could end up with a diminished SEO footprint from the start. Can you edit English words easily in extended URL strings? Can you edit individual Title Tags and Description Tags data on an ad hoc basis? Does your CMS platform force dynamic URLs that you cannot modify? Does your CMS platform prevent you from changing your Header and Alt Tags? If your company is using one of the free open source platforms, keep these observations in mind. WordPress has a Multi-Lingual plug-in available that is template-driven but hard to edit. It requires modification of the template to achieve your SEO goals. Joomla has a multi-lingual plug-in available called JommFish. But, has a reputation as not being very SEO friendly. Drupal has a strong developer community and a reputation for being SEO friendly. Deploy your website in-country using that country’s domain-TLD. This is the best option, but there are significant costs associated with this strategy. If you have significant brand-capital invested in your website, you could redirect the CC TLD to a sub-folder or sub-domain in your English website. You can create a sub-domain for each one of your foreign language properties. If you decide to go the sub-folder or sub-domain route, make sure that you register these folders and sub-domains as separate accounts (set geographic target) with your search engine’s webmaster tools. How does a search engine such as Google decide if you belong in one of their country-specific search indexes? Google can detect pages written in German, but it may be hard to identify whether it is Dutch German or Swiss German, if no other indicators are available. What if your website has multiple languages on a single page? A human may understand what you are doing but search engines may have trouble figuring out which country search index it belongs in. Make sure you do the following to ensure you end up in the proper country search index. Make sure your website has a declared language in the HTML source code. Make sure your language is declared in your webmaster tools account. If you have your foreign language website in a sub-folder hosted for example, in San Francisco, you will need to declare the language / country for that folder. Declaring a language is merely the first step, Google is interested in indexing only high-quality websites with substantive content. Keep these issues in mind when you are developing your new foreign language website. Auto-translation technologies can be a real timesaver, but sometimes result in poor quality content if the results are not curated. Google is suspicious of auto-generated content, so if you use auto-translation technologies make sure that a real person reviews and edits the work for grammar, coherence and local nuance. Have a native speaker translate your website and keywords – recent college graduates who are not native speakers will rarely pick up the nuance that comes from a lifetime of growing up and living in the country. Translating keywords without understanding how consumers actually search for hamburgers and insurance in France is problematic. Again local nuance is required. Having a lot of English slang in your website copy will present problems. Most of the time you will never be able to translate this into a second language. Jargon detection will be an issue. A lot of English business and technical jargon in your foreign language website may not be the best way to engage your global customers. There is a great deal of variability of term usage from one Spanish-speaking country to another. Gender is not much of a language issue in the US, but it certainly is elsewhere in the world. Search engine relevance algorithms differ from language to language. For example, stemming does not work very well in Romanic languages (Spanish, French or Portuguese). Stemming allows you to associate terms such as compute and computing. Word order differs from country to country, which impacts search results. Search engine spam filters currently are not as advanced, and don’t work as well outside of English content. However, I think this will be a short-term problem. The use of hyphens and underscores in URL strings in Asian languages, and the use of tilde and accents (vs. the ASCII English equivalent ) in a URL. Understand who the dominant search engines are for each country. Don’t assume that Google is the dominant player. For example, in France there are 15 search engines alone to deal with. For a comprehensive list of search engines from throughout the world check Steve Arnold’s website, which has a list of close to 500 search engines listed by country. In this post I have dealt with the first four topics in the following list that impact multi-lingual SEO. “We have worked with Mark Sprague and the Lexington Consulting Group over the last 15 years. There are few people that have the expertise and experience to stay current in the ever changing world of technology. We heartily recommend Mark and his colleagues.” Robert E. Shapiro, CEO, Waterford Development Corp. If you would like to find out more about the rest of the international SEO issues in the above list, send me an email at Mark@MSprague.com or call me now at 781-862-3126.